I’ve been sent some goodies the other week and I’m excited to review them for you!! 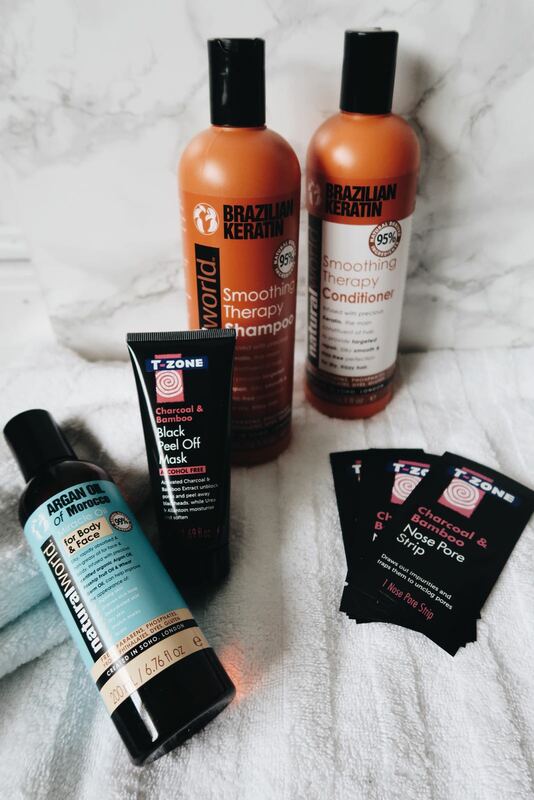 The products I was sent were the Brazilian Keratin Shampoo, the Brazilian Keratin Conditioner, the Argan Oil of Morocco Miracle Oil for Face and Body from Natural World and the Charcoal & Bamboo Black Peel Off Mask and Nose Pore Strips from t-zone. First I want to clarify, that the picture on Instagram was sponsored, however this blog post is not. Either way, you will always hear my honest opinion no matter whether it is for a sponsored product or not. Generally speaking, I only write about products I’m happy with and which I would recommend to my close friends. I have fine hair, which often makes it difficult to find the right shampoo, especially when it comes to shampoos for frizzy hair or shampoos that are supposed to add extra shine and softness, as they always make my hair look flat and lacking any volume. Therefore I usually stay away from those types of shampoos. The one that was sent to me aims to do exactly this, so I didn’t expect good results. Both the shampoo and the conditioner have a light and fresh smell. The shampoo has a creamy consistency and doesn’t foam much. I prefer it this way as, out of experience, lots of foam dries my hair out a lot. I think it has something to do with the type of silicone in those types of shampoo. As I have fine hair, using conditioner can also be tricky. I always only ever put a very small amount in the length of my hair and I never leave it in for the full time, as suggested on the bottle. On this one it says to leave it in for 2-3 minutes. However, I put it in by running my fingers through my hair and washed it out. In total, I probably had in my hair for about 30 seconds to one minute. I have to say, that I was impressed with the end result, which was soft and shiny hair with lots of volume and very easy to style. Cruelty free, produced in London. You only need to use a little amount of product. One bottle goes a long way. 500ml product only cost below £10. Free from parabens, phosphates, phthalates, dyes, gluten. I was very happy with the result and would buy the product. However, as I have found out, all Natural World products apart from the Kreatin and the Honey Range are not only cruelty free but also vegan. Therefore I will try their vegan range in the future. This product has got a slight sweet smell to it and reminds me a bit on coconuts. I love that smell! This oil is supposed to improve the appearance of, ageing skin, uneven skin tone, dehydrated skin, dry skin, stretch marks and scars. It is free from Parabens, Phosphates, Phtalates, Dyes and Gluten. Especially during the change of the seasons my skin tends to get dryer and I’m usually using body lotion for dry skin, so this oil came just at the right for me. I only use a small amount of product and as with the shampoo and conditioner, a little goes a long way. It hydrates my skin without leaving it greasy and without drying out my skin on the long run. (which often is the case when I’m using body oil). I’ve used this oil on my face and neck leaving my skin smooth and hydrated. However, the problem was that even when using a small amount I ended up having greasy hair. This has nothing to do with the product as this will happen with any type of oil. To give my opinion on how the products works in all the other areas mentioned, I have to say that I did not use the product long enough to make a judgement. Cruelty Free and Vegan, produced in London. Small amount goes a long way. 200ml for £4 – great value for money. Will probably not use it on my face due to getting my hair greasy. This is just personal preference. Otherwise there are no cons I can think of. Where to buy Natural World products? The mask is supposed to unblock pores and to peel away black heads. I was excited to try it as I’ve read a lot of positive things about it. The first trial was quite messy, as I was in a rush and tried to take the mask off before it was dry. I ended up partly peeling it off and partly washing it off. Peeling the mask off is quite uncomfortable. It’s a similar feeling to getting rid of a plaster. However, I was amazed by how smooth my skin felt after and the evidence of the blackheads (which I wasn’t even aware off) in the peeled off mask. The second time I have used it I put it on for the full 30mins. Peeling off the mask then was neat and clean. So, if you are using this mask, make sure you leave it on until it is completely dry to get the best results and also make sure to leave out the sensitive areas around your eyes, because otherwise it will probably be painful to take off. Alternatively you can use the strips, to clean the area on and around your nose, which is usually most affected by black heads. Those strips have a minty smell which gave my nose a quite strong tingle. Also with those ones it is important to leave them on until they are completely dry to get the best results. The mask and the strips feel uncomfortable to peel off. Luckily I have good skin and don’t need these types of masks on a regular basis. The process to take it off and having to leave it on for 30mins is for me, as an impatient person, too long. So I would probably not buy it again, unless I would have strong blackhead occurring. I love cruelty free products. I have been using Argan oil for my hair too. It really helps me with my dry skin during winter time. Would love to try the rest of the products that you like.